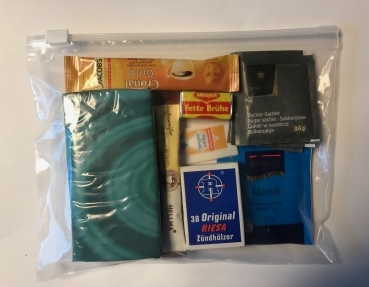 Our Feddeck Ration Pack is made up of original German Armed Forces items or similar. A Ration Pack is provided as a survival ration for one person per day. The average nutritional value of the single-pack is approximately 3,000 kcal. Emergency food is distinguished by a high nutritional value and low weight and is immediately ready for consumption. This makes it ideal for outdoor and trekking activities. 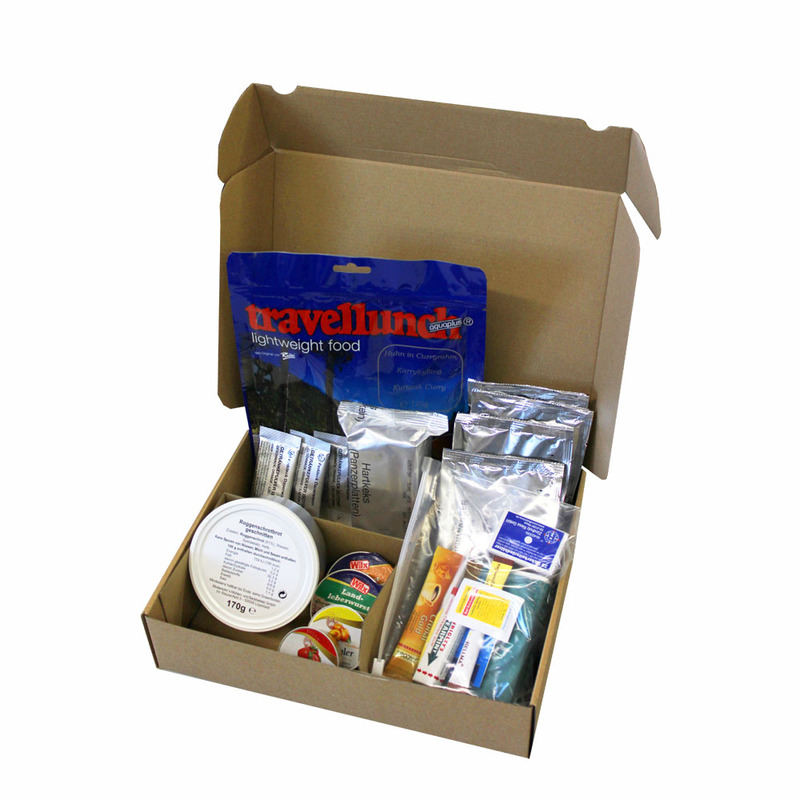 For easy storage, we deliver our ration packs in a flat cardboard box. The ready-packaged ration packs allow uncomplicated distribution and rationing in case of disaster. The federal office for civil protection und disaster relief also recommends the provision of emergency food for private households. Note for relief organizations and large customers: Feddeck Dauerwaren GmbH also offers large quantities of ration packs at short notice! Please contact us directly if necessary, so that we can calculate an individual offer. 1 x Long-term dry food, Beef Casserole 125 g, Ingredients: Noodles (hard wheat semolina, egg white, salt), gravy, beef (8%), cured vegetable fat, roasted onions, frying powder, potato starch, whey product, tomato powder, cream powder, salt, mushrooms, herbs, natural flavors, spices. Allergene: Gluten, eggs, milk. May ycontain traces of soy and celery. ingredients: soft wheat flour, sugar, partially hydrogenated sunflower fat, glucose, salt, raising agents (sodium bicarbonate, ammonium bicarbonate), antioxidants: sodium metasulfite). May contain traces of soy, egg, milk and sesam. Country liver sausage: Sausage: pork 45%, pig liver 31%, bacon, rind, iodized nitrite curing salt (iodized food salt, preservative E250), herbs, onions, spices, maltodextrin, emulsifiers: E471, E472c, thickeners: E415, spices extracts. May contain traces of celery and mustard. Coarse liver sausage: pork 81%, pork liver 15%, bacon, iodized nitrite curing salt (iodized food salt, preservative E250), spices, glucose syrup, maltodextrin, emulsifiers: E471, E472c, thickener: E415, antioxidant: E301, spice extracts. May contain traces of celery and mustard. Delicatessen liver sausage: pork 51%, pig liver 30%, bacon, iodized nitrite curing salt (iodized food salt, preservative E250), spices (including mustard), glucose syrup, sugar, dextrose, maltodextrin, emulsifiers: E471, E472c, Thickener: E415, antioxidant: E301, spice extracts, aromas. May contain traces of celery. Ham Cream: Pork 75%, pork liver 15%, bacon, iodized nitrite curing salt (iodized food salt, preservative E250), spices, maltodextrin, emulsifiers: E471, E 472c, Thickener: E415, Antioxidant: E300, E301, spices extracts, aromas. May contain traces of celery and mustard.